After the Jamaican-Asian fusion restaurant Patois had to temporarily close up shop last year due to a fire, chef and owner Craig Wong came up with a new restaurant concept specializing in Hainanese chicken. Being a huge fan of this dish, I was really excited to hear about the opening of Jackpot Chicken Rice last fall. 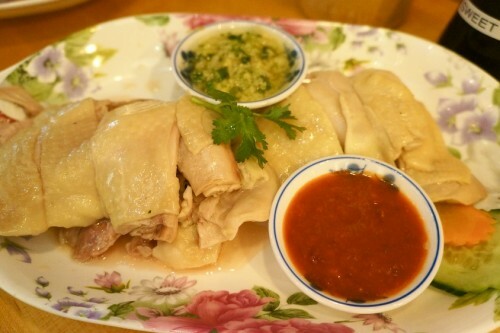 Hainanese chicken is a dish which originates from the province of Hainan in China and is very popular throughout Hong Kong, Malaysia and Singapore. When Craig Wong announced the opening of this chicken joint, I expected a little hole-in-the-wall take-out corner serving only chicken rice so I was surprised to see that it had opened as a full-blown full-service restaurant. 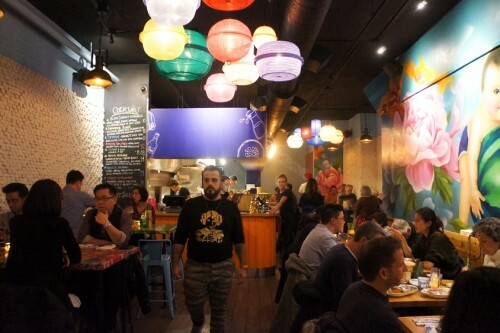 It’s a fun space with a playful mural down one wall of the restaurant featuring a baby with a giant watermelon. The use of all the bright and vibrant colours makes it a really happy space. There are tables in the front of the restaurant as well as counter seating overlooking the kitchen. Seating capacity is roughly 40 people and while walk-ins are welcome, they also accept reservations. 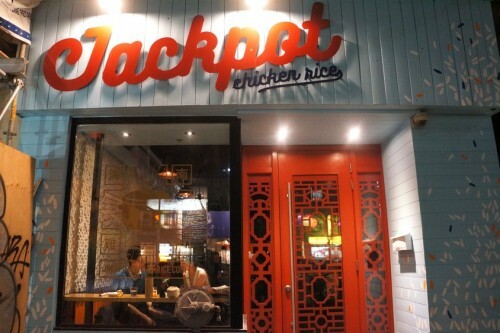 Jackpot Chicken Rice is open every day from 11am to 11pm. Mike and I dropped by for dinner at around 6:30pm on a Saturday without a reservation and all the tables were occupied so we grabbed a couple seats at the counter. 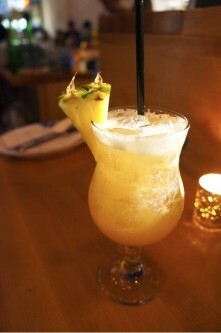 If you’re coming for lunch, be aware that their lunch menu is a slimmed down version of their dinner offerings. The dinner menu offers a selection of snacks ranging from $2.50 for a bowl of winter melon soup to $10 for the Jackpot stickers and large plates which range from $14 for tofu with mushroom rice (vegan) to $19.50 for the ‘Cereal killa prawns’. You can add foie gras to anything for an extra $12 for 3oz or $22 for 6oz. Similar to the “Whole Shebang” at Patois where you can eat the entire menu, Jackpot Chicken Rice has a “Go All In” option which is priced for $70 for two guests, $115 for four guests and $155 for six guests. The two-guest option includes a choice of any two snacks, any two large plates, crispy chicken skin, schmaltzy rice, soy eggs and soup. Depending on what you want to order and how much food you want to eat, it may or may not be that economical – you may end up with a lot more food than you need. We decided to order a la carte. From the ‘snacks’ section of the menu, we started off with a bowl of Winter Melon Soup – master stock, crispy shallots, scallions ($2.50). Mike normally doesn’t like Asian soups since it’s generally not as hearty and flavourful as the thick and chunky soups he grew up on but this bowl of soup won him over. It was intensely flavoured and was a nice way to kick off the meal. 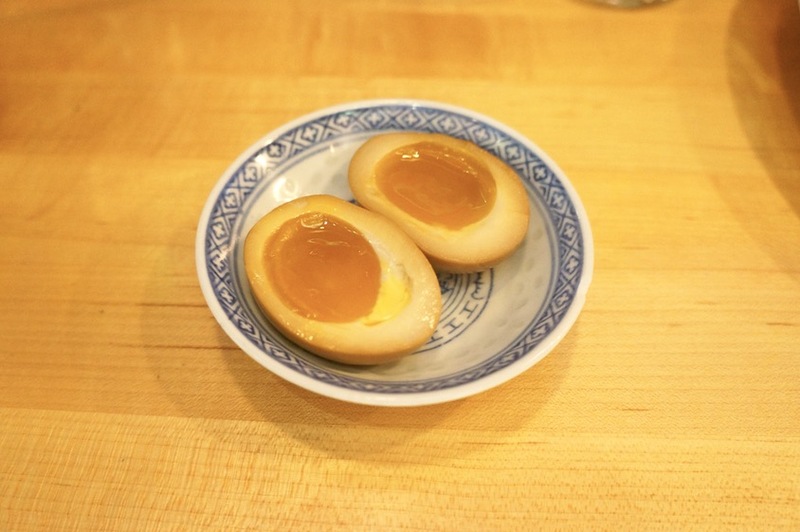 Also from the ‘snacks’, we ordered a Soy Sauce Egg – soft poached, soy & shaoxing ($3.50 each). $3.50 might sound like a lot for one egg but trust me, it’s worth it. The egg was perfectly poached with a beautifully soft yolk and the egg had an intense soy flavour which permeated the entire egg. Everyone might come for the chicken but you’d be doing yourself a disservice if you don’t order the egg. 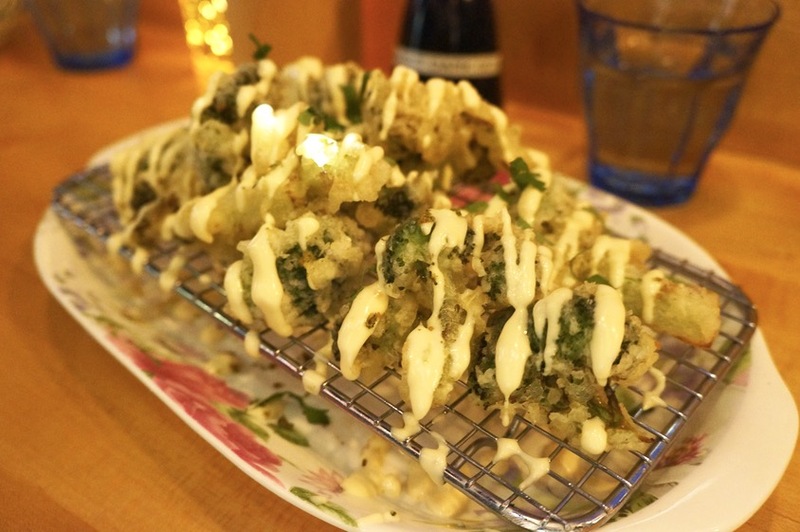 A more substantial ‘snack’ we ordered was the Kaffir Broccoli Tempura – lime & roasted garlic, cilantro, kaffir lime furikake ($9), another highlight of the meal which reminded me of the OG fried cauliflower dish from Patois. I loved the light, crispy batter and with the drizzled aioli and kaffir lime furikake, it was guaranteed that each bite would be a punch of flavour. We couldn’t come here without trying their signature Jackpot Chicken – poached Hainanese-style with traditional soft skin, ginger-scallion and chili sauce ($16). The chicken itself was excellently cooked – very soft and succulent. It was served de-boned which was a nice touch. However, flavour-wise, I was a little disappointed as I found it on the bland side. The accompanying ginger-scallion sauce was very much needed! One thing to note is that the prices are on the high side when compared to other restaurants serving the same dish. But to be fair, you do get a lot of chicken and since it’s all de-boned, everything you see there is pure meat. 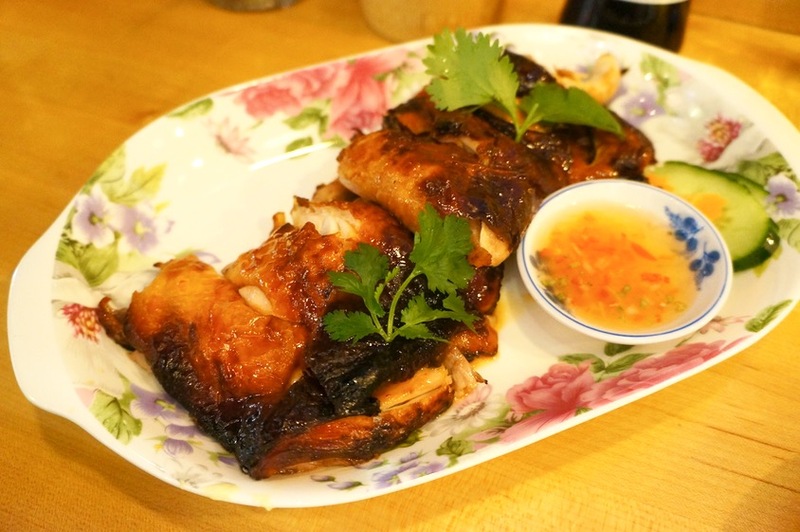 We also tried the Fire Roasted Chicken – sambal-glazed, roasted in a Chinese BBQ oven, thai fish sauce ($16). While the flavours of the Jackpot chicken were subtle, the fire roasted chicken was quite the opposite. The fire roasted chicken had this delicious sambal-glazed skin and I found it so flavourful on its own that it didn’t really need the accompanying fish sauce. Between the two chicken dishes, this was definitely our preference. The chicken dishes don’t come with any sides (unless you come for lunch in which case they offer chicken combos with rice) so we ordered some Chicken Rice ($6 for two; $11 for four). This schmaltzy rice (i.e. cooked with chicken fat) was served family style and for those who don’t eat meat, they also offer a vegan mushroom seaweed rice. This rice is typically served with Hainanese-style chicken – Jackpot’s version is cooked in their master stock and has a nice oiliness to it. This was more than enough food for the two of us. We didn’t have enough room for dessert but the kaya French toast caught my eye – something for next time! While the Hainanese chicken that we came for was a little disappointing, we enjoyed everything else we ordered. If you find yourself in the area, Jackpot Chicken Rice is a solid option.